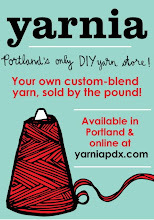 That’s right, this coming Wednesday is the next Knit & Crochet Night here at Yarnia! Bring your patterns, projects, ideas, questions, and meet some other crafty peeps in the neighborhood! Swing on by after work and we’ll make a night of it. We’ll be here knitting from 6:30 to 9:30 p.m., and will have tea, wine, music, good company, and some little snackies to keep us going! I know I’ve got LOTS of projects that I need to get off the needles soon…how about you? First Knit & Crochet Night of the Season! Knit & Crochet Night Resumes!